If you love Benedicts as mu ch as I do, you have to check out Bill’s! They are located in San Jose, CA. but don’t let that stop you from at least checking out their menu featuring 11 different kinds of Benedicts! From the classic Benedict to Caprese with fresh tomato, mozzarella and balsamic, to Crab Cake, and even Cordon Bleu served on a croissant! On our visit, we had to wait outside to get a table because they place was filled with people! It was totally worth the wait because the service matched the deliciousness of the food. I highly recommend going, if you find yourself in the area, but if not, let their menu inspire you to make your own take on a Benedict at home. Lets talk about poaching the eggs, first. I grew up making poached eggs in one of those handy dandy “cups that fit over a skillet of water” thing a ma jigs. Poaching is: the process of gently simmering food in liquid. So essentially, those contraptions we were talking about, aren’t really poaching the eggs, because they are never “in” the simmering liquid! Its intimidating to just go cracking an egg into some hot water. The good news, is that eggs are still relatively cheap. (I just bought 5 dozen for $6.00!) So if you ruin a few, don’t sweat it! Take some time to practice poaching and get comfortable with the technique. Step 1: Add water and a splash of white vinegar to a pot and bring it to a simmer. (Just when you see small bubbles forming.) Try to maintain this temperature. This in itself may be a difficult task as you might have some “getting used to” with the temperature setting of your stove top! Why the vinegar? It actually helps the whites of the egg to start to solidify. You need all the help you can get when cooking at this low temperature. You want the yolk to stay intact, but the whites to cook around it. Step 2: Add the egg into the simmering water. Don’t just go cracking it straight in your first time. A heavy plop in the water is no good. Try cracking the egg into a ladle, then gently and slowly letting it slip into the water. You’ll probably see some of the whites stream off the the egg and float around in your simmering water. Thats fine, the bulk of the egg will stay together. Let the egg cook for about 3 minutes. With a slotted spoon, gently scoop the egg up and give it a slight jiggle in the water. You’ll be able to see what is solid and what is still liquidy. The yolk should jiggle, but there should be little to no movement from the whites. 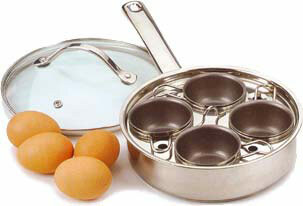 Step 3: Gently remove the egg from the water with the slotted spoon and set on a plate to drain off any excess water. You don’t want to put it straight onto the bread and then have a soggy mess. Melt 1 stick of butter in a skillet. Meanwhile put 3 egg yolks in a blender with 1 tbsp lemon juice, some salt and pepper. 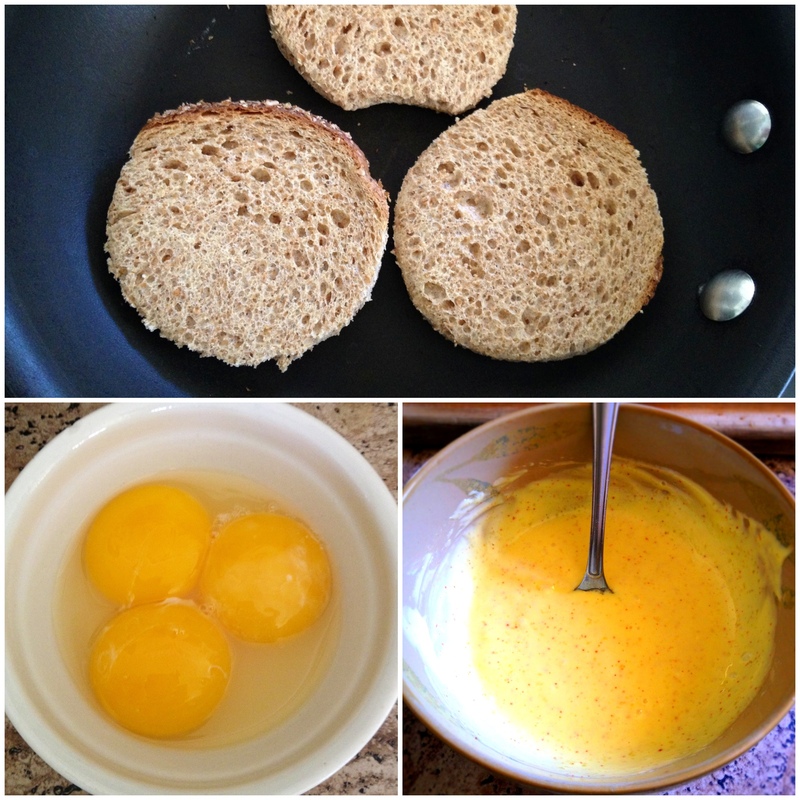 Blend the yolks together. While the blender is on, slowly pour the melted butter in. Let it continue to blend and turn into a thick creamy sauce! Pour it out and stir in some cayenne pepper (optional). Use the sauce while it’s warm. As it cools, it will start to thicken. To reuse this sauce, don’t microwave it! Stir in a little hot water! Now assemble those Benedicts! 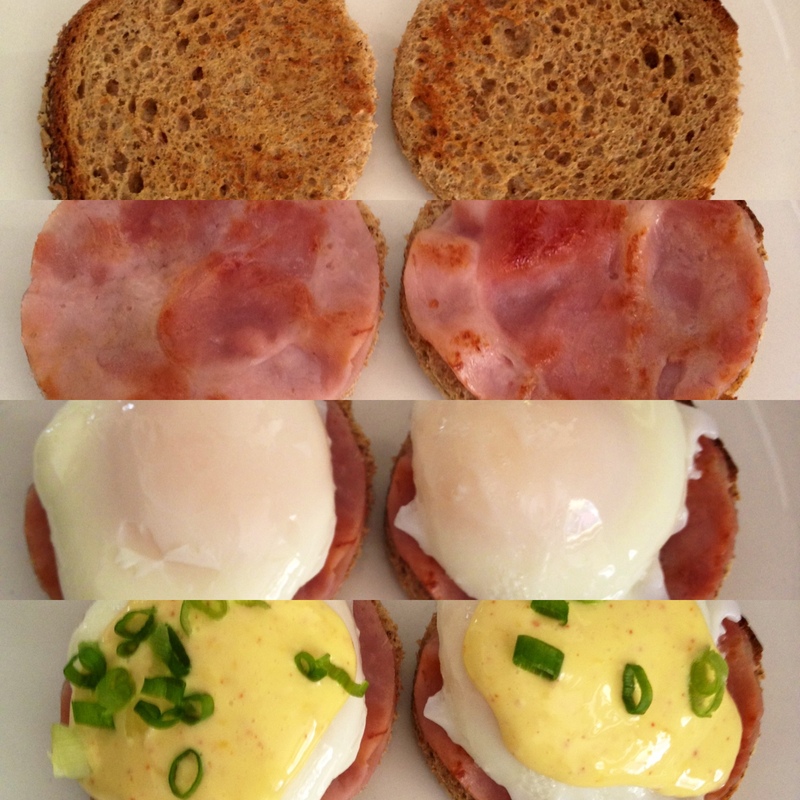 Use toasted english muffins, or just plain toast on the bottom. Warm some Canadian bacon/ham on a skillet, and top the bread. 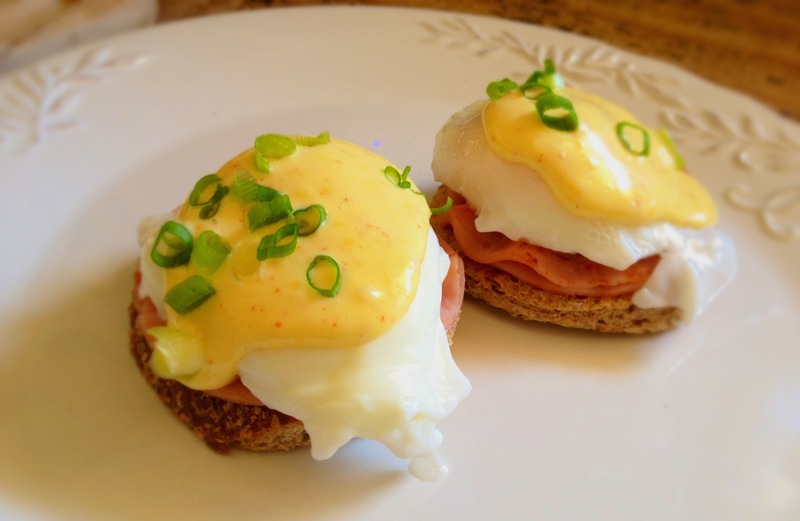 Then place the eggs, and spoon on the hollandaise! Garnish with some green onion or a sprinkle of cayenne pepper. YUM!